Diwali 2018 is upon us and we’re sure you are looking for some tech goodies that you can gift your loved ones this festive season. Diwali is also a time for great online discounts and one of the best seasons to purchase smartphones because of the numerous offers and buying options available online. 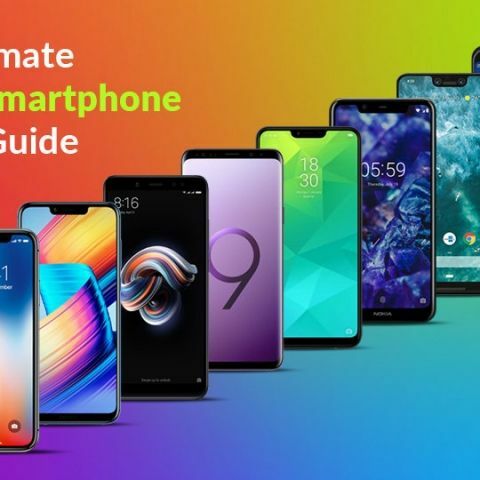 With this ultimate Diwali smartphone gifting guide, we aim to give you some of the best buying/gifting options available across premium, mid-range and budget smartphones along with easy links to complete your purchase without having to leave this article. So, if you are looking to do some serious smartphone shopping this Deepavali, you need not look further than this list. It doesn’t get more premium than the new 2018 Apple iPhones. The iPhone XS Max (review) is the top-of-the-line device with all the flagship features you can ask for. If you really want to impress someone this Diwali, the iPhone XS Max starts at Rs 109,900 for the 4GB RAM, 64GB storage option and brings with it a beautiful display, fast & reliable performance and good cameras. The smaller, iPhone XS (review), is for those looking for a more compact premium flagship phone as it has a 5.8-inch display compared to the 6.5-inch display of the XS Max. All other features and specs of the iPhone XS match that of the XS MAx. The iPhone XS starts at Rs 98,999. The iPhone XR (first impressions) is for colour lovers and unlike the XS and XS Max, the XR comes in six colour options - Black, PRODUCT (RED), Blue, Coral, White, and Yellow. It’s got all the same specs as the other two top-tier iPhones, except for the display, battery and single rear camera. It is also the cheapest new iPhone you can buy right now, with prices starting at Rs 76,900. The iPhones might be the most premium smartphones you can buy but if awesome cameras are what you are looking for, look no further than the new Google Pixel 3 (review) and Pixel 3 XL (review). Both phones are simply great at photography and come with the best specs any Android smartphone can have right now. It really is a no brainer if you are looking to buy good looking smartphones with great cameras, both front and back. The 64GB and 128GB storage models of the Pixel 3 are priced at Rs 71,000 and Rs 80,000 respectively, while the 64GB storage model of the Pixel 3 XL costs Rs 83,000 and its 128GB variant is priced at Rs 92,000. The Huawei P20 Pro (review) shames almost all other smartphone cameras in the market (except the Google Pixel 3 phones), thanks to the Leica-branded optics paired with adequately sized imaging sensors. The beautiful colour treatment makes the Huawei P20 Pro a distinctive smartphone, one that you cannot mistake for another. Again, the P20 Pro features flagship specs, including a 6.1-inch full-HD+ OLED FullView display, three cameras at the back, a 4,000 mAh battery, Kirin 970 processor and more. The smartphone comes with 6GB RAM and 128GB expandable storage. It is priced at Rs 64,999. The Samsung flagships for 2018 - Galaxy Note 9 and Galaxy S9, S9+ are also up there with Apple and Google’s premium flagship smartphone offerings. While the Galaxy Note 9 (review) brings a large 6.4-inch display, 6/8GB RAM, 128/512GB storage, and 4,000 mAh battery, the Galaxy S9+ features a smaller 6.2-inch display, 6GB RAM, 64/256GB storage and a 3,500 mAh battery. Both phones have a dual 12MP camera setup at the back which performs very well. The Galaxy S9 Plus starts at Rs 64,900, while the Galaxy Note 9 starts at Rs 67,900. The newest flagship on the block, the OnePlus 6T is for those who need good performance and best-in-class specs at a not so premium price tag. This time around, the OnePlus 6T features an in-display fingerprint sensor, a large AMOLED display, a big 3700 mAh battery, and Google’s latest operating system Android 9 Pie on board. You can pre-book the OnePlus 6T from Amazon.in right now by paying Rs 1000. If you do pre-book the phone, you can also get the OnePlus USB Type-C Bullets earphones worth Rs 1,490 free with the purchase of the phone. You can read about all buying offers for the OnePlus 6T here. The phone will launch in India on October 30 and will go on sale on November 1, just in time for Diwali. If you are looking for mid-range devices, the Xiaomi Poco F1 (review) guarantees flagship specs at affordable prices. The Poco F1 is the cheapest phone to be powered by the Snapdragon 845 and it's certainly fast. In our review of the phone, we noted that the Poco F1’s camera, build and display can’t keep up with the more expensive flagships of 2018. However, if a no-nonsense performer is what you’re looking for on a budget, look no further. The Poco F1 starts at Rs 20,999 and comes in 6GB and 8GB RAM variants, with 64GB, 128GB and 256GB storage options. The ZenFone Max Pro M1 (review) from Asus is a stellar mid-range to buy right now. It features a 5.99-inch IPS full HD+ Full View display, Qualcomm Snapdragon 636 SoC with Adreno 509 GPU, a 5000mAh battery, a 13MP + 5MP dual rear camera setup and an 8MP camera on the front. Both the front and rear cameras are supplemented with an LED softlight. It is available in three variants, one with 3GB RAM and 32GB storage priced at Rs 10,999, another with 4GB RAM and 64GB storage priced at Rs 12,999, and the third with 6GB RAM and 64GB ROM storage which costs Rs 14,999. The Xiaomi Redmi Note 5 Pro (review) is one of the best smartphones you can buy in the sub 15K segment. It offers excellent performance, has a two-day battery life, both front and rear cameras are good and a sturdy build quality. It comes in two variants, one with 4GB RAM/64GB storage priced at Rs 14,999 and another with 6GB RAM/64GB storage priced at Rs 16,999. The device features a 5.99-inch FHD+ 18:9 display and the Qualcomm Snapdragon 636 SoC. It comes equipped with a 12MP + 5MP dual-rear camera setup and on the front has a 20MP sensor with Selfie-light and Beautify 4.0 feature. The phone is backed by a 4000 mAh battery and features a rear-mounted fingerprint sensor. The Xiaomi Mi A2 is the second device by the company to launch under the Android One program and runs on stock Android OS instead of a MIUI based interface, giving it the added advantage. It features a 5.99-inch Full HD+ screen with an 18:9 display aspect ratio and is powered by the Octa-core Qualcomm Snapdragon 660 chipset. On the back are the fingerprint sensor and a vertically stacked 12MP+20MP dual-camera setup. On the front is a 20MP sensor with Xiaomi's Super Pixel Technology. In our review, we noted that the phone is the jack of all trades and master of some. It has a stellar camera and reliable performance, packaged in a robust, functional design. The 4GB RAM/64GB storage variant of the Mi A2 costs Rs 16,999, while the 6GB RAM/128GB storage option costs Rs 19,999. There are some exclusive cashback offers also available with the purchase of the phone right now. The Honor Play (review) brings the company’s flagship hardware to an even lower price point, making it one of the most powerful devices under Rs 25,000. Add to it the GPU Turbo feature which reduces battery drain and you get a very lucrative device for gamers and those who like consuming a lot of visual content on their phones. The smartphone features a 6.3-inch FHD+ display, Kirin 970 SoC, 3750mAh battery, 16 MP AI Selfie camera and 16+2MP AI Rear Dual cameras. It is available in 4GB RAM + 64GB storage option priced at Rs 19,999 and another 6GB RAM + 64GB storage variant priced at Rs 23,999. Xiaomi’s budget contender, the Redmi 6, features a 5.45-inch HD+ display, a brushed metallic finish on the rear panel and an ‘Arc’ design. It is powered by a MediaTek Helio P22 Octa-Core chipset, which is clocked at 2.0GHz. The dual-SIM handset supports dual VoLTE with dual standby too and comes with AI Face Unlock, along with a fingerprint sensor. In the camera department, the smartphone features a 12MP + 5MP dual-rear camera setup with a 1.25µm pixel size and EIS support. The rear camera supports AI portrait mode to capture “better” bokeh shots. The device is backed by a 3000mAh battery that is said to deliver up to 12 hours of video playback. The Redmi 6 comes in two variants, one with 3GB RAM/32GB of internal storage priced at Rs 7,999. The 3GB RAM/64GB storage version of the device is priced at Rs 9,499. The phone is available on Flipkart and Mi.com, but you will have to wait until it comes back in stock to purchase it. The Nokia 5.1 Plus (review) offers the right stuff: an above-average display, camera, performance, and battery life. It’s definitely worth its price of Rs 10,999. The device features a 5.86-inch HD+ display, a MediaTek Helio P60 chipset with 3GB RAM and 32GB onboard storage, with an option to expand it by up to 256GB. In the camera department, the phone features dual 13MP + 5MP lenses with a f/2.0 aperture, and on the front, there is an 8MP unit with f/2.2 aperture and 80.4-degree angle of view. It’s biggest USP is Android One certification, which means it will get regular security and OS updates, at least for the next two years. The dual-SIM smartphone is backed by a 3060 mAh battery, which is claimed to deliver up to 12 hours of video playback. The Realme 2 (review) is a good value-for-money phone and features a 6.2-inch HD+ display with a notch on top. It is powered by the Snapdragon 450 SoC. The dual-SIM smartphone is backed by a 4,230mAh battery with AI Power Master technology. On the rear is a 13MP main camera, paired with a 2MP secondary lens with PDAF technology. On the front is an ‘AI-powered’ 8MP lens. It comes in a 3GB RAM/32GB internal storage variant, which is priced at Rs 8,990 and the 4GB RAM/64GB storage model of the device costs Rs 10,990. The Honor 7A comes in only one variant of 3GB RAM/32GB storage priced at Rs 8,999. It features a 5.7-inch HD+ IPS LCD display, a Qualcomm Snapdragon 430 Octa-core, a rear mounted fingerprint sensor, face unlock, a 13MP + 2MP dual camera setup on the rear, an 8MP front camera, dual-SIM support, a 3,000mAh battery and EMUI 8.0 based on Android 8.0 Oreo. The Lenovo K9 (first impressions) is a new entrant in the budget segment and comes with four cameras on board. The Lenovo K9 is offered with 3GB RAM and 32GB storage for Rs 8,999. It features a 5.7-inch full-screen HD+ display with an 18:9 aspect ratio. The smartphone has an aluminum alloy frame and there is a fingerprint sensor on the back panel. It is powered by an octa-core MediaTek MT6762 processor clocked at 2.0 GHz. The smartphone ships with a quadruple camera system -- two on the back and other two on front. Both the dual-camera setups have 13MP primary lenses and 5MP secondary sensors. Lenovo claims that both front and rear cameras can shoot bokeh shots, incorporate rapid autofocus and complemented by LED flashes. The Lenovo K9 houses a 3000mAh battery and runs on Android 8.1 Oreo. which is the best cheapest smartphone of range 5K to 10K ? which is the best smartphone to buy in range 10k-15k?